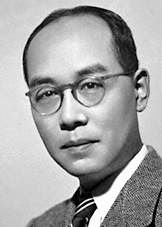 Hideki Yukawa was born in Tokyo in 1907, as the third son of Takuji Ogawa a professor of geology at Kyoto Imperial University (now the University of Kyoto). He obtained his MS degree from Kyoto University in 1929 and a DSc (equivalent to S3) from Osaka University in 1938. Between 1932 and 1938, he followed his father's footsteps as teachers at Kyoto University and in 1939 he became professor of theoretical physics at the university. He also served as an assistant professor at the University of Osaka. Yukawa craze in the field of physics research, especially related to elementary particle physics has seen since his youth. Yukawa once said, that interest into physics theory heavily influenced by professor K Tamaki, Y Nishina in Kyoto and Tokyo. In 1949, Hideki Yukawa who won the Nobel Prize in physics seemed to tell the world that the people of Asia also save huge potential in the field of science. He puts his country, Japan as the second country in Asia after India successfully received international recognition a remarkable achievement in the field of physics research. He jokingly said that his interest in part also due to his inability to master the art of making simple glass laboratory equipment. In 1935, when he was 27 years old, Yukawa published a paper entitled On the Interaction of Elementary Particles I. In the publication, he proposed a new theory of nuclear forces and predicted the existence of particles called mesons later. According to him, the same as the electromagnetic force carried by photons, the nuclear force carried by the meson. After the discovery of a type of meson by the American physicist in 1937, Yukawa more spirit again to concentrate his research on the development of this meson theory. Particle predicted by Yukawa was originally to be called the "Yukon" for the honor, but eventually people choose names for reasons meson particle mass is among the mass of the electron and proton mass is about 200-300 times the mass of the electron. Pi-meson particle discovery in 1947 made a name Yukawa increasingly skyrocketed. These findings further convince people that the Yukawa theory of nuclear forces are on the right track. Top predictions about the existence of mesons which later proved this empirically, Hideki Yukawa was later confirmed as a great physicist with physics Nobel prize presentation of the Swedish Academy of Science in Stockholm, Switzerland. Nobel prize money from that then he hibahkan to establish a new institute of theoretical physics at Kyoto. While continuing to develop the theory of mesons, Yukawa also intensified in researching theories related to elementary particles. Teon theory called non-local field has helped many developmental theories of nuclear physics. Theories derived from these ideas were widely published in scientific journals as well as in his book Introduction to Quantum Mechanics and Introduction to the Theory of Elementary Particles. Among many duties, he still managed to become editor of the journal Progress of Theoretical Physics. In 1948, Robert Oppenheimer invited to join the group Yukawa nuclear physics and worked for the Princeton Institute for further education. Later he became a professor at Columbia University, USA in 1949. Besides the Nobel, awards ever received, among others from the University of Paris, the Royal Society of Edinburgh, the Indian Academy of Sciences, the International Academy of Philosophy and Sciences, and the Pontificia Academia Scientiarum. Of his own country, he was also awarded the service. Yukawa known as being fun. Colleagues happy to hang out with humility attention .. When appointed as a professor at Columbia University, Oppenheimer said, "Predictions on Dr. Yukawa meson is one of a very bright idea in the last decade. In daily life, he was loved by all his colleagues both as a physicist and as a person. " Despite being busy as a researcher, Yukawa also finds time to be active in social activities. In July 1981, four months before he died, Yukawa together with a group of scientists made a statement prohibiting the use of nuclear weapons. (John Surya).